Give your hair an instant, extra strong hold with brilliant shine. L’Oréal Professionnel Infinium Extra Strong provides extreme instant fixing of a section or long lasting overall hold to your hair. It has a patented formula designed to give the ultimate finish to your hairstyle, with optimal shine. 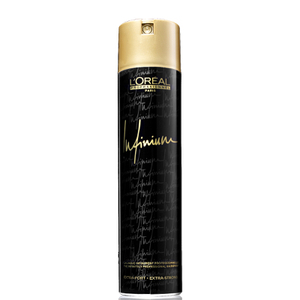 L’Oréal Professionnel Infinium has an anti-humidity action, so your hair keeps its style even in humid conditions. This spray won’t leave residue in your hair and has a neutral perfume. Use L’Oréal Professionnel Infinium Extra Strong on your dry hair. Spray it from a distance of about 35cm.